President Trump delivers remarks about border security in the Rose Garden at the White House on Friday. 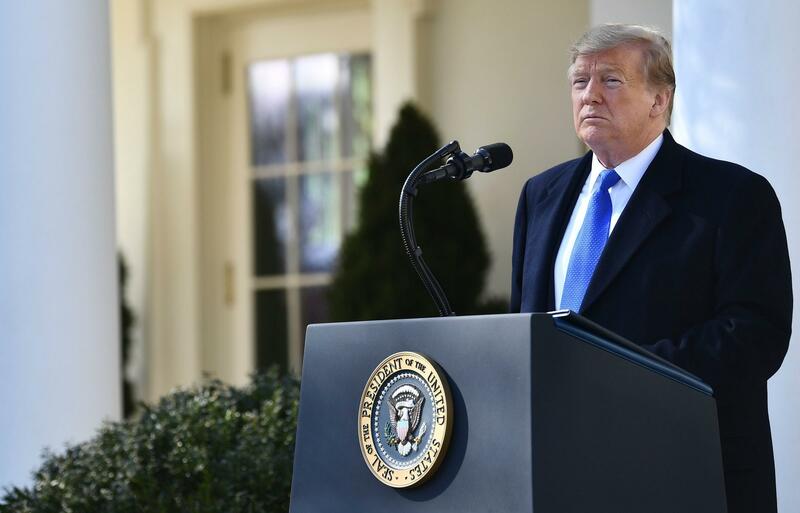 In circuitous remarks in the Rose Garden, Trump said he was declaring an emergency because of "an invasion of our country with drugs, with human traffickers, with all types of criminals and gangs." The move came a day after Congress approved a spending bill giving Trump around $1.3 billion in border security funding, far short of the $5.7 billion he had called for. Trump signed the bill Friday afternoon, averting another government shutdown until at least October. Invoking emergency powers frees up additional funding. Legal challenges and pushback even from some within his own party await Trump in the next phase of the ongoing national political battle over border security and immigration policy — cementing the issues at the forefront of his bid for a second term. The House Judiciary Committee announced Friday evening that it is launching an "immediate investigation" into Trump's decision to declare the national emergency. The committee is requesting that those involved in the declaration, including White House counsel Pat Cipollone, testify on Capitol Hill. Chairman Jerry Nadler, D-N.Y., and six other House Democrats who chair subcommittees of the judiciary panel, signed the letter to the president, writing that "we believe your declaration of an emergency shows a reckless disregard for the separation of powers and your own responsibilities under our constitutional system." Opponents of the declaration say that Trump's claim of a crisis at the border is overblown and that the move is unnecessary. Illegal border crossings in the most recent fiscal year (ending in September 2018) were actually lower than in either 2016 or 2014 and much lower than at their peak around 2000, as NPR has previously fact-checked. Many of the most recent arrivals are Central American migrants seeking asylum, citing a fear of violence or persecution back home. "The President's actions clearly violate the Congress's exclusive power of the purse, which our Founders enshrined in the Constitution. The Congress will defend our constitutional authorities in the Congress, in the Courts, and in the public, using every remedy available." White House officials say Trump's executive action, including the emergency declaration, will free up about $8 billion for border wall construction. That includes the $1.375 billion in the funding bill passed by Congress on Thursday. $600 million from the Treasury drug forfeiture fund. Some $2.5 billion from counter drug activities with the Department of Defense and some reprogramming from other Pentagon accounts. Some $3.6 billion in military construction funds. No disaster money will be used. Rep. Adam Smith, a Washington Democrat who chairs the Armed Services Committee, called the reallocation of funds "utterly disrespectful of U.S. national security and the needs of our men and women in uniform, and it further undermines his credibility in requesting the upcoming defense budget." White House officials say the $8 billion should allow Trump to build as much wall as he wanted to — 234 miles of barrier — had Congress authorized the $5.7 billion he asked for. 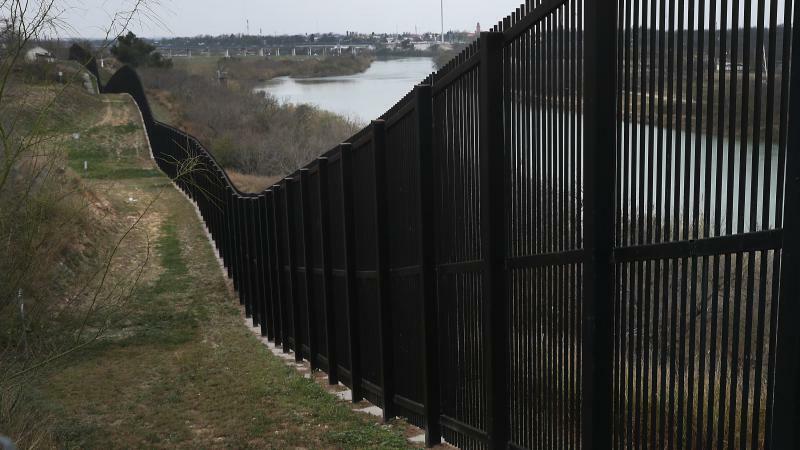 Officials say plans are to construct a metal bollard barrier, not a concrete wall, at locations to be determined by Customs and Border Protection. Trump said Friday that he expects such legal challenges and predicted they would eventually reach the Supreme Court, where, he said, "We'll win, I think." "I didn't need to do this," Trump said in response to a reporter's question about the emergency declaration. "I just want to get it done faster, that's all." Senate Majority Leader Mitch McConnell, R-Ky., who had previously cautioned Trump against declaring a national emergency, said Thursday he was on board with the president's move. However, others within the GOP have pushed back. Centrist Sen. Susan Collins, R-Maine, who is up for re-election in 2020, called Trump's planned move a "mistake" in a statement Thursday. Collins also argued that the National Emergencies Act was only "intended to apply to major natural disasters or catastrophic events, such as the attacks on our country." "Such a declaration would undermine the role of Congress and the appropriations process; it's just not good policy. It also sets a bad precedent for future presidents — both Democratic and Republican — who might seek to use this same maneuver to circumvent Congress to advance their policy goals. It is also of dubious constitutionality, and it will almost certainly be challenged in the courts," Collins said. Rep. Will Hurd, R-Texas, whose districts covers about 800 miles along the U.S.-Mexico border, said Friday on The View that the declaration was "unnecessary" and expressed concerns about the land seizures that would have to take place in order to build the wall. "What we should be talking about is the strategy on how to defend our border, not one specific tool, which is the wall," Hurd said. 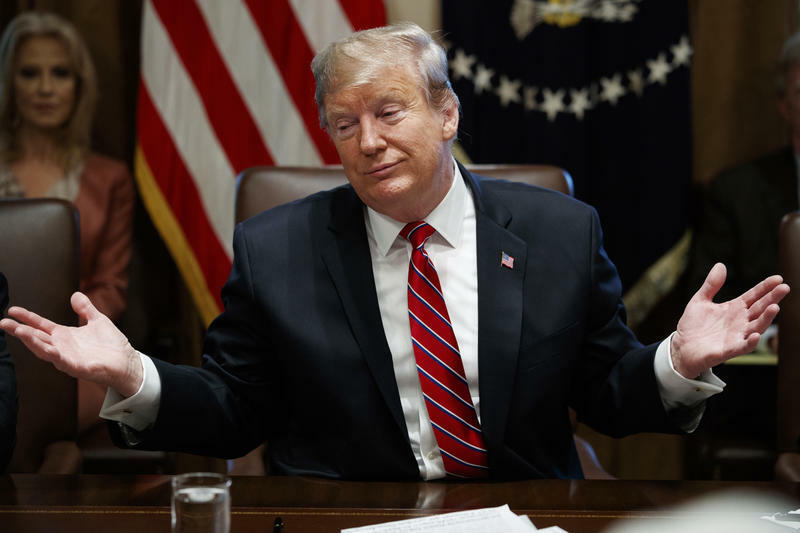 But to Trump, declaring a national emergency likely seems to be the only way he can claim victory after weeks of back-and-forth over funding for border security that included a record 35-day partial government shutdown. President Trump speaks after he received a briefing on border security next to Texas Republican Sens. 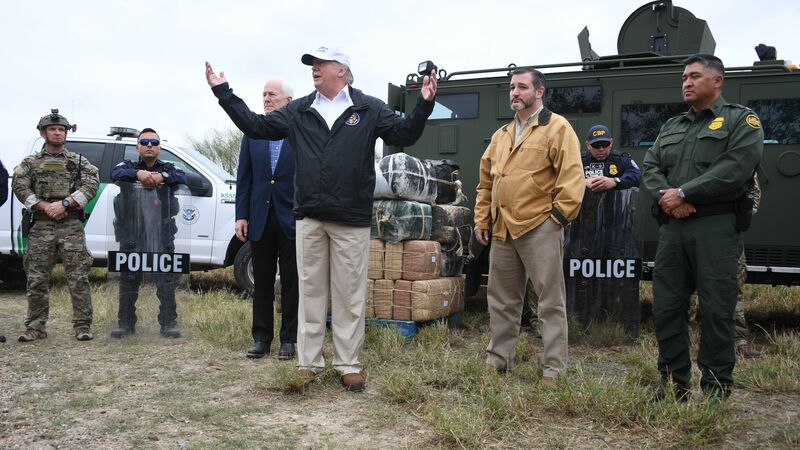 John Cornyn (on the left of him) and Ted Cruz (on the right) near the Rio Grande in McAllen, Texas, on Jan. 10. Another shutdown would have been risky, and there wasn't much appetite for going that route again among congressional Republicans. But there's little support among the public for Trump's approach either. A CNN poll earlier this month showed Americans oppose — by more than 2 to 1 — Trump using a national emergency declaration to build a border wall. That seems to be one of the messages Democratic leaders will home in on during what is likely to be a new phase in the standoff over border security. In the Democrats' Spanish-language response to Trump's State of the Union earlier this month, California Attorney General Xavier Becerra said he would sue the administration if Trump declared a national emergency to find funds for a border wall. On Friday, appearing alongside California Gov. Gavin Newsom, Becerra said a lawsuit would likely be coming soon. "This is not 9/11. This is not the Iran hostage crisis of 1979," Becerra said, citing past presidential emergency declarations. "This is a president showing his disdain for the rule of law and our U.S. Constitution." Added Newsom, "Donald Trump, we'll see you court."